In a moment of cosmic irony, this question was posed 2,000 years ago by the governor of Judea to the governor of the universe. It’s the same question philosophers have been asking for centuries, and still ask today. What is Truth? Had Pilate been with Jesus earlier in His ministry, Pilate would have heard Jesus say that “I AM the Way, I AM the Truth, I AM the Life. No one comes to the Father except through me.” Jesus Christ is Truth. His inspired Word is Truth. And if we are to follow or worship Him, we must do so in Spirit and in Truth. What is Truth? What do YOU believe to be True? Whether you realize it or not, you ask and answer this question dozens of times a day. The single most fundamental aspect about who and what you are is not what you think, not what you wear, not what you drive, not where you live, not where you work – it’s what you believe. Specifically, what you believe to be True. It will determine how hard you work, what kinds of friends you pick, what kind of spouse you end up with, how you deal with people, what kind of church you go to – it will even determine where you spend your eternity. In the final analysis, whether you like it or not, Truth is Truth, whether you believe it or not. It’s not changed or affected by what you decide to believe. We don’t get the luxury of inventing what is Truth and what is not. So what do YOU believe? Is what you believe grounded in reality? Is it grounded in Truth? When you look at your belief system (and everyone has one, even the atheist), do you have a solid foundation for Truth, or are you topsy-turvy with all kinds of self-conflicting ideas and notions from all sorts of incompatible sources – like the blind leading the blind? I submit to you that the Bible, as the infallible Word of God, is the ultimate source of Truth for anything that truly matters in life. I submit that when the Holy Spirit says that “all Scripture is given by inspiration of God and is profitable for doctrine, for reproof, for correction, for instruction in righteousness. That the man of God may be perfect, thoroughly furnished unto all good works” that He meant exactly that – that God’s Word is a necessary ingredient if we are to meet our full potential and be all that we can be. Truth is not something we set on a shelf – it must be applied in order for its value to be realized in our lives. Jesus said the greatest thing we can do – the greatest commandment – is to love the Lord our God with all our heart, soul and mind, and the second is to love our neighbor as ourselves. First things first: How do we love the Lord? Jesus said if we love Him, we will keep His commandments? Where do we get His commandments? Simply put, His Word. His Truth. Period. And that Truth will set us free. Anything we believe other than His Truth will keep us enslaved in what will ultimately result in the dead-end of death and destruction (2 Peter 3:14-17). Before we jump into the interpretive process of hermeneutics, we need to step back and discuss the question of how we come to conclude that a thing is Truth. After all, different people can witness the same event and still have different conclusions as to what just transpired. As it turns out, there are several things that try to influence our ideas about what Truth might be. Whether we notice it or not, all of these elements weigh differently in our minds and affect what we conclude to be Truth. And as you may have noticed, several of these things are subject to the human condition and therefore capable of error (namely the first 4). Assuming we can properly balance these influences, we should also ask is if these influences have a ranking order. At times, these influences will contradict each other, so a prudent student will have a ranking order so that one influence is held to be more authoritative than the others. Emotions: Every child (and many adults) can testify to the fact that the fear of the unknown easily leads to thoughts and sightings of monsters or worse. If there is a hierarchy here, emotion has to be dead last! Experience: Hot stoves are good teachers, but once burned twice shy can make a person stay away from something that can be very beneficial when properly harnessed. Politicians seem stuck at this level. Reason: At its best, reason can cause us to conclude proper things: I think, therefore I am. But talk to my crazy aunt for more than a few minutes and you’ll see that not everyone reasons the same way. (The same can be said for politicians.) If I can see her flawed logic even though she can’t, can someone else see my flawed logic even though I can’t? Can someone else properly see your flawed logic even though you can’t? Only pride would prevent us from realizing that reason is an excellent aid, but cannot be a final authority on discerning Truth. My crazy aunt gets lost on this level. Tradition: If it weren’t for tradition, we’d have to re-invent the wheel every generation. But if an error gets incorporated into that tradition, we can be stuck with error for generations. Even though my crazy aunt has never heard of the Vatican Council, they both get stuck on this level quite a lot. General Revelation: By observing nature (general revelation), science can teach us a great many things, and as long as we interpret it properly, nature will always say the same thing. This is a pretty good standard for truth (again, provided our interpretation method is correct – and that’s no trivial caveat). But it cannot tell us about metaphysics, sin, salvation or the afterlife – the more important issues of life and death. Because we blend methods and influences when determining Truth, it is imperative that we are aware of these influences that color (and discolor) Truth. To that end, it is imperative that we have a disciplined method of studying and interpreting God’s Word lest we miss what God is trying to tell us. Jesus taught that the Bible is key to life and freedom – but how do we read and understand the Bible? Can we just open it up and read it like a newspaper or novel? The first and greatest challenge to hearing and understanding the Word of God is a spiritual challenge. It is the Holy Spirit that teaches us the Word of God and without His assistance, we cannot understand the spiritual Truths of the Bible. For this reason, it is imperative that we come to terms with the fact that spiritual things cannot be discerned by spiritually dead minds (1 Cor 2:14). Studying the Word of God without first praying for the assistance of the Spirit of God is folly. The second challenge to hearing and understanding the Word of God is the human challenge. Because the Bible was not written to our 21st-century Western mindset, a number of human hurdles separate us from being able to simply sit down and read it like we would the daily newspaper. The 40-plus authors of the Bible are separated from us in a number of ways: language, culture, geography, history, politics. To properly navigate these challenges, it is important that we use an interpretive process to understand what the Bible’s authors’ mindsets might be and how we might best communicate these Truths to ourselves and our audience. 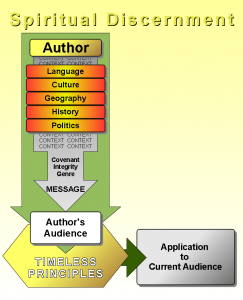 This interpretive process is called ‘hermeneutics’, and this diagram demonstrates the challenges set before us in unraveling the Truths in the Bible. Spiritual Discernment – We start by prayer. The Word of God is to be spiritually discerned. Language, Culture, Geography, History, Politics – We read the language of the author (as near as we can get to it and still make sense of what’s going on), paying attention to his culture (the more we know about it, the better we understand what he’s saying), his geography (lay of the land is useless if we’re ignorant on geographical markers), his history (prophets, in particular, speak often of Israel’s history), and his current politics (many interpretive errors await those who don’t understand the political lay of the land). 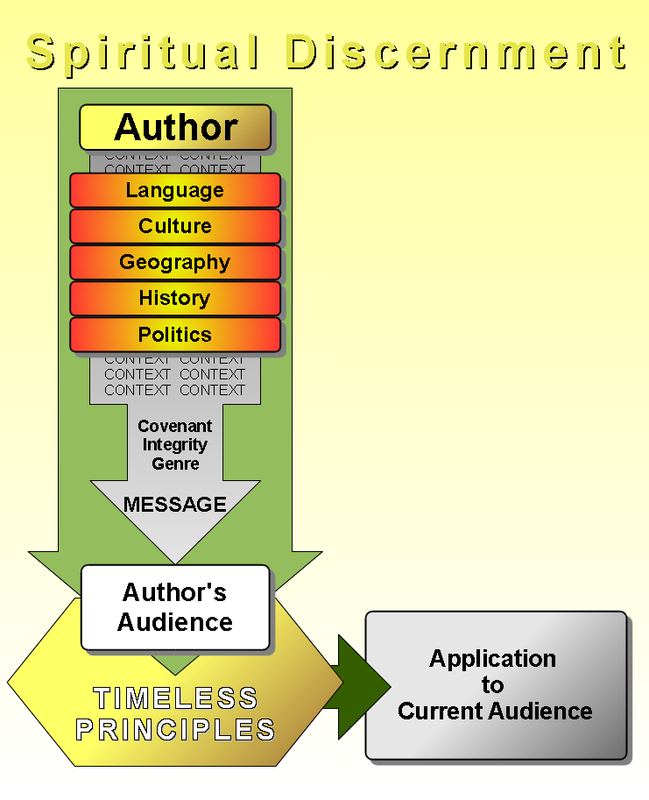 Context – All this must be done with full attention to the context of what the author is saying. These authors aren’t stupid; they intend to say intelligent things, and picking their words out of context is a sure fire way to assume they meant things they had no intention of saying. Try this with a very common passage like Ps 139:23-24. Lots of songs have been sung about it. Now start in v19 and read to the end and see if v23-24 suddenly don’t take on a new meaning. Dittos for 2 Tim 3:16-17. Verses 14-15 kinda put the emphasis of v17 in a direction that many people don’t take it. Integrity – The inspiration of all of Scripture means that the same Spirit – same Mind – is at work in all the words of the Bible. This gives us a good deal of Integrity from Genesis to Revelation. So when we hit a passage that seems odd, we need to be Bereans and examine the rest of the Bible to see if this passage is at odds with the rest of the Bible, or if it is part of a consistent theme – meaning that our minds are at odds with Scripture. Isaiah 6:9-10 is an excellent example. Verse 10 sounds odd and out of sorts with much of what is preached today. But it is quoted directly in Matthew, Mark, Luke, John, Acts, Romans, Corinthians and Revelation. In fact, 1/2 the books of both the Old Testament and the New Testament either quote it directly or allude to this theme. (It’s the 3rd most frequently quoted OT passage in the NT). Instead of seeing this as an odd passage to be safely ignored, the consistency and integrity of the Bible compels us to conclude that this is a major theme. Genre – We cannot properly understand the author if we ignore the genre. Is the passage poetic? Historic? Legal? Prophetic? Etc. Message – Once we’ve grappled with these issues, we’re now in the same seat that the author’s audience was sitting in, and we’re ready to hear the message as the author intended his audience to hear it. From this point, we can glean the Timeless Principles in the message and then do something of a reverse process to apply these timeless truths to whatever cultural context we find ourselves. Some passages are easy to understand, but others are a bit more difficult. Still others seem simple when actually they’re quite difficult (Jesus’ parables come to mind). These difficult passages require more effort to understand, but the reward is well worth it. This effort is what Paul means when he teaches his audience, and us by implication, to “study to show ourselves approved”; to “be sober and diligent”. It’s what Jesus means when He talks about bringing out treasures both old and new. It can be work, but it’s well worth it.